There are currently 3,460 users on this website. So we're making an attempt to return to eBay... see if the experience now is as horrible as it was before. Our first listing in over 2 years is up, a Scott #2 on cover, with full letter contained in the pages. 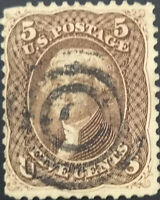 Newly listed items on eBay by ClassicPhilatelist. View all ClassicPhilatelist's items on eBay. Welcome back to the devourer of souls, the crusher of consciousness, and the pinnacle of consumerism. You will never leave again! Muh wahh hah hah hah. At least you can check out anytime you like, apparently. Wow! Almost sounds like Dante's immortal line from Inferno, "Abandon hope all ye who enter here." This IS a desirable cover with a very nice (double) red grid cancel. One recommendation I have is to note any faults on the stamp itself. I see a crease at the lower left corner of the stamp, and also the overall vertical bend/fold due to the folded letter itself. It is possible that my observation is only an artifact of the scan, and there are indeed no faults. But if there are, they should be noted. Even though prospective buyers may be able to see this from the photo, my listing practice is to describe any condition detractors in case the buyer has not noticed, since they have not examined the item in hand. You'll be lucky to get half the start price for that cover on eBay. 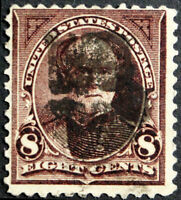 Damaged stamp on a damaged cover from the most common city with the most common cancel. As a side note, I don't know what catalog you're looking at but there is no premium for New York, no premium for New York's grid cancel, and no catalog premium for letter content. paperhistory, thanks for the feedback. Regarding the premiums applied, this is from experience selling covers in shows, and what people pay for these. Sure, it's subjective, and is the equivalent of an auction house "estimating" the value an item will sell for even if it doesn't. I don't believe I'm breaching any ethical bounds by pointing this out, which is why the are separate from the Scott CV for just the item on cover. People can decide if that's valuable/useful to them our not. Our pricing is still almost 1/2 CV, so we're not making any outlandish claim that it's some kind of rare item. The letter content value is based on it being a reasonably long discussion about some matters, and various references to money exchanging hands on different dates (I think it might even be a bit of a compliant, I really can't read the handwriting of about 50% of it, and it's not worth it to me to try and decipher it). But I know that I have sold material in the past where there is at least a 1 page letter involved, which get higher values than just an empty envelope or a folded letter that says "We revived your order for wagon wheels at $37 each, and we're shipping you 15 of them". orstampman, thanks for the comments, I'll have a look at it. I didn't pick that up before, but you may be right, and likewise, we like to call out any issues. We didn't specify the hole in the letter because it's dead obvious, and is a result of the wax sealing of the folded letter. We're not placing so much the value of the cover on the condition of the folded letter, which overall isn't too bad. We have a lot worse. Let me give it a look. orstampman, did you mean corner cease at lower right? (Not left). I see no crease at left, and the stamp itself has not been creased due to folding, but I do see a corner crease at right. I'll update that in the description. EDIT: Updated, and we've added $12 in US postage as an incentive to offset the cost of the expedited international shipping. Finally I've figured out a way to use my postage lots! I would also point out that for many items, especially on the pricier side, actual hi-resolution scans might bring more or higher bids. Your photos are OK but shadows, depth perception and such might cast more doubt on overall condition than a true scan. And by the way you might find interested parties (not necessarily prospective buyers!) might use eBay's "watch" option so they could see if your item sells later. Like looking at comparative sales or "comps" in realty markets. Of course some of those eBay users might end up as interested buyers! ClassicPhilatelist - Yes, the lower right corner - sorry about that! It took 0.82 seconds to lick this stamp.